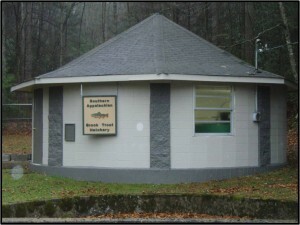 The Southern Appalachian Brook Trout Hatchery at Tellico, http://www.wix.com/brooktrout/hatchery, is a unique partnership between the U.S. Forest Service, Tennessee Wildlife Resources Agency, and Trout Unlimited. Along with additional support from other state and federal agencies and conservation organizations, the partnership is dedicated to supporting wild native brook trout restoration efforts in the Southern Appalachians. Restoration objectives are achieved through an interdisciplinary partnership of interagency and public resources utilizing captive spawning propagation protocols and post restoration monitoring and assessment methods. With an emphasis on establishing wild self sustaining naturally reproducing populations throughout the Southern Appalachian region, the Facility’s mission is to provide critical support to each of these restoration components.